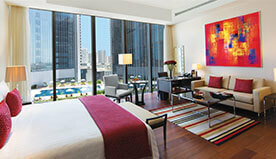 The Oberoi Dubai | Karwan-e-S A Travels & Tours Pvt. Ltd. The Oberoi, Dubai is a contemporary luxury hotel in Dubai, whose design embodies height, light and space. We offer uninterrupted views of the iconic Burj Khalifa from our prime location amongst hotels in the UAE, being just minutes from Dubai Mall and Dubai International Financial Centre. Our chic, elegant restaurants guarantee to satisfy discerning palates. Guests looking for a luxury dining restaurant in Dubai can choose between our all day dining space: Nine7One, our highly acclaimed speciality Indian restaurant: ananta, the chic lobby lounge or elegant lobby bar. The Oberoi Spa in Dubai offers Western, Balinese, Thai and Ayurveda inspired treatments. We also have a 24-hour gymnasium and a temperature-controlled swimming pool (83 feet/25 metres long). 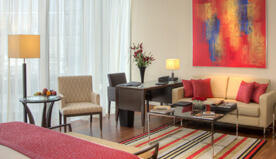 We offer all guests complimentary access to high speed Internet for up to four devices. 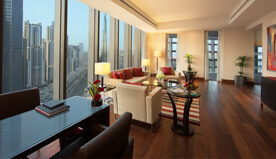 Guests who book in advance and directly with us can also enjoy special rates, exclusive privileges and hotel offers. We would be happy to take care of any business requirements or help ensure a relaxing holiday with loved ones. 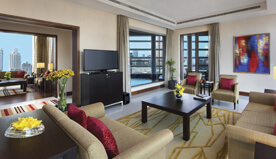 Our hotel offers are designed to ensure you have an unforgettable Oberoi experience. 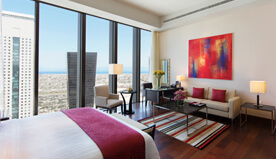 Bright, spacious rooms with views of Dubai’s dramatic skyline and Burj Khalifa. We offer a wide range of dining options to satisfy diverse and discerning palates. Located minutes from Dubai Mall, the Dubai International Financial Centre and just 20 minutes from the airport. Located on the top floors of the hotel, our Presidential Suites are spread across 2529 square feet (235 square metres) and feature a grand master bedroom with a study, a spacious living room that extends onto a balcony with a plunge pool, and a dining room with a fully equipped kitchenette. Our Presidential Suites are decorated in a chic natural pallette with white marble and rich wooden floors. Bespoke modern furnishings are punctuated with deep scarlet and gold features. Specially commissioned modern art adorns the walls and handcrafted chandeliers sparkle from high ceilings. Guests will delight in the light-filled, immaculate Italian marble bathroom of this suite. From the standalone bathtub or the glass-panelled, vari-pressure shower, guests can bathe, relax and refresh using Oberoi exclusive toiletries while enjoying stunning views of the iconic Burj Khalifa. Two or Three Bedroom Family Suites are spread across 2,713 square feet (252 square metres) and 3,273 square feet (304 square metres), respectively, and include one king size bedroom, one twin bedroom, and a third bedroom with either a king or twin beds. These suites also have a richly furnished living room, a dining room, a bathroom and a separate powder room. 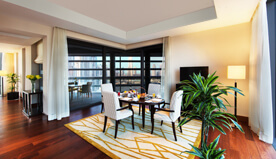 Our Two & Three Bedroom Family Suites also feature a private balcony from which guests are afforded panoramic views of the Burj Khalifa and Downtown Dubai’s skyline. Floor-to-ceiling windows in all rooms allow an abundance of natural light during the day and spectacular night sky views. Guests can recharge and refresh in this suite’s exquisite Italian marble bathroom, while enjoying stunning views of the Burj Khalifa and the city. Our bathrooms feature a large, free-standing bathtub, a separate glass-panelled, multi-pressure shower and dual vanity counters. 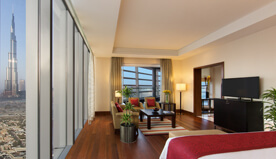 Our Premier Rooms epitomise luxury and comfort. Each is furnished with a king-size or twin beds, afforded our signature pillow menu and featuring a smart work space, living area and Italian marble bathroom. Fitted with electronic privacy blinds and an electronic safe, they are also extremely safe and secure. Our 560 square foot (52 square metre) Premier Rooms feature magnificent floor-to-ceiling windows that provide abundant natural light during the day, uninterrupted views of Dubai’s spectacular Burj Khalifa and the city’s glittering nighttime skyline after dusk. Guests can recharge and refresh in this room’s exquisite Italian marble bathroom, while enjoying stunning views of the Burj Khalifa and the city. Our bathrooms feature a large, free-standing bathtub, a separate glass-panelled, multi-pressure shower and dual vanity counters. Our spacious Luxury Rooms are furnished with a king-size or twin beds, and featuring rich teak furniture and original, modern artworks. Punctuated with dramatic crimson upholstery, they are filled with natural light during the day and lit by ambient spotlights in the evening. Our Luxury Rooms feature floor-to-ceiling windows that refresh the rooms with magnificent views of the hotel’s azure swimming pool. In a plush sofa or armchair, guests can take advantage of our 24-hour in-room dining service in the soft sunlight or while enjoying the glittering night sky. Our bathrooms feature a full-length bathtub, multi-pressure shower and double vanity counters. Carefully crafted out of creamy Italian marble, guests can refresh with our exclusive plant-based toiletries, wrap up in thick cotton bathrobes and enjoy views of the hotel’s pool. Afforded a comfortable king-size or twin beds and our signature pillow menu, our Deluxe Rooms are warm, welcoming residences. Polished timber floors, rich fabrics, hand-tufted rugs and specially commissioned artwork accentuate the elegance of the bedroom, work space and living area. Designed to emphasise light and space, our 560 square foot (52 square metre) Deluxe Rooms feature high ceilings and magnificent floor-to-ceiling windows that provide an abundance of natural light, while framing matchless views of Dubai’s dramatic skyline. From the creators of award-winning restaurants and lounges Iris and Indie DIFC, comes your unconventional Italian restaurant, MATTO. A home-grown brand based on classic Italian food with a side of mischief, MATTO aims to recast the archetypal Italian dining experience. Showcasing the skills of chefs who took ownership from their grandmother’s kitchen with an innovative menu and catering to a gastronome crowd, MATTO is decidedly refreshing and worldly.